This is another painting that I did with my class on watercolor washes. The sky is a wet in wet gradated wash. The distant island as well as the posts were done as a flat beaded wash. The closer islands and the foreground foliage was a wet in wet wash. The image is taken from a photo of Discovery Passage. April Point Resort and Spa on Quadra Island (which is off the coast of Vancouver Island, BC) is a place that I often teach workshops. It is a beautiful location with lots of wildlife. The orca (or killer) whales are often seen passing through here. There are many fabulous whale watching tours and fishing trips to be taken. I will be returning to April Point on May 30-June 1 to teach a course called Fun with Watercolours. We will be painting a heron and pouring a beautiful background to go along with it. 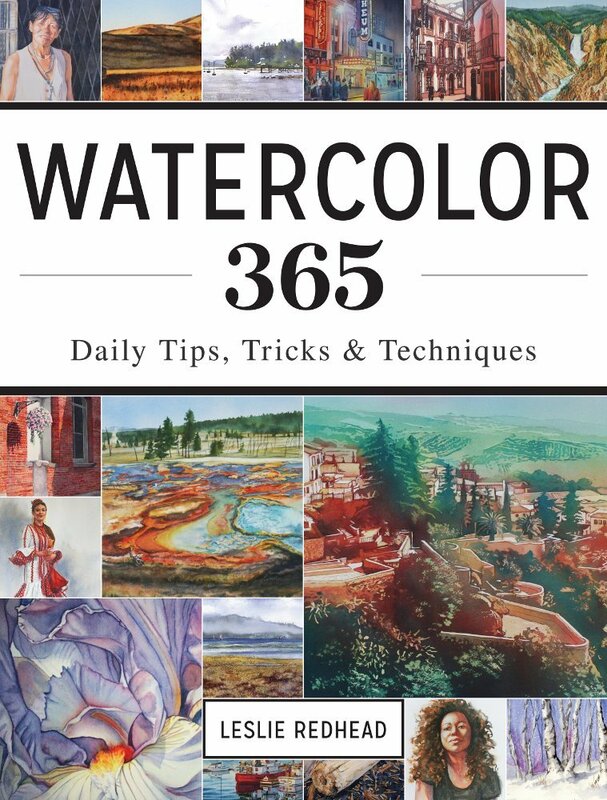 I will also be teaching a course called Fun and Free Watercolours just the 2 days before that (May 28-May30) at Painter's Lodge in Campbell River, BC on Vancouver Island. Painter's Lodge is seen directly across the passage from April Point Resort. This course is a fun approach to landscapes. The price for each course plus a 2 night stay is only $199/person. On Sunday I had the opportunity to return to Vancouver Island to attend Birgit O'Conner's workshop. This workshop was hosted by my good friend and artist, Sam Boehner. Sam started painting with me nearly 5 years ago. Before that she had never picked up a brush. 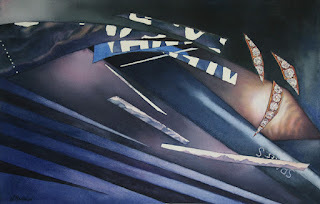 She was awarded signature membership of the Canadian Society of Painters In Watercolour just 2 weeks ago. Yeah! 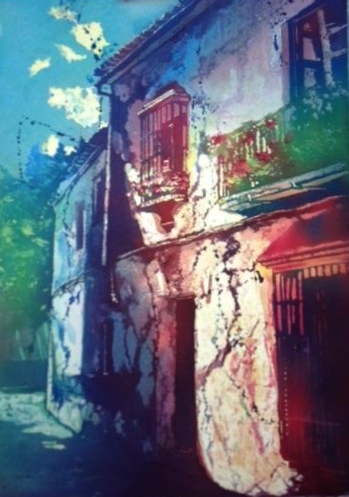 She is also the owner of Lady Slipper Studios and is now bringing well known watercolorists to Victoria to conduct workshops. I am so proud of her. It is just an amazing feeling to watch a student accomplish their dreams. Many of the attendees of the workshop were my students while I lived in Victoria and Sam didn't tell them that I was coming over for the day. So it was a surprise and I enjoyed seeing so many wonderful old friends, including Cathy who took this photo and John, who continues to crack me up. It was also nice to meet Birgit. We only had a few hours to chat but she is truly a kindred spirit. To view more of Birgit's work, please click here. To see more of Sam's work, please click here. 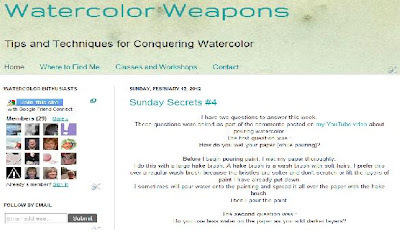 Today I am teaching a workshop on washes. 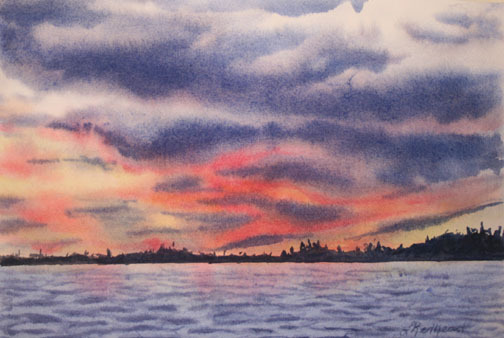 The above painting is an example of a sunrise done with wet in wet washes. I usually paint urban landscapes by pouring my paints but I decided to try painting one a more traditional way. 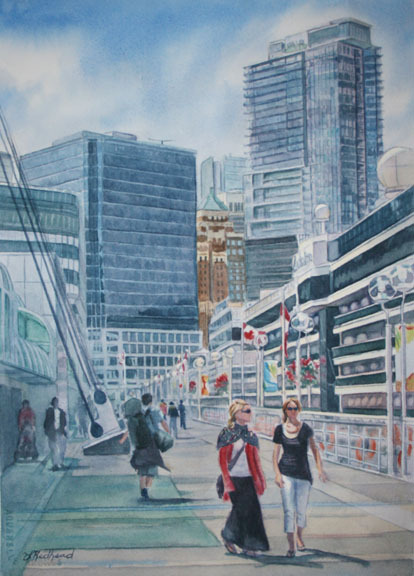 I did enjoy painting a Vancouver scene with it being sunny instead of the usual grey and rain. However, Vancouver has a city ordinance where the buildings are to be built all grey and green. Strange in a city that is already grey and green. Canada Place Promenade is a well known tourist attraction and where the big cruise ships dock. The Promenade is a walk across Canada since it names all the provinces and the more well known cities within each province along the sidewalk. 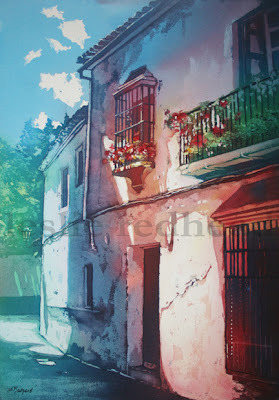 I am teaching urban landscapes on Mar 11-12 at the Monterey Centre in Victoria, BC. More information can be found on page 43 in their brochure by clicking here. Yesterday I finished the above painting with my Friday class. It is another poured watercolor. 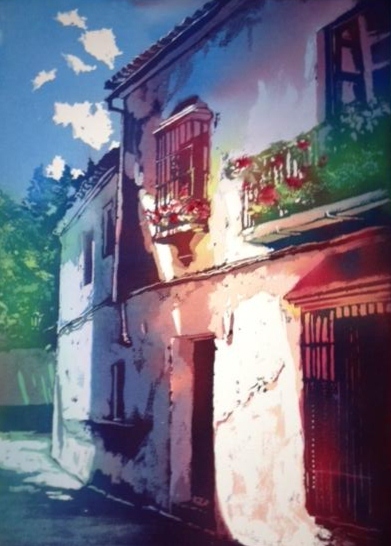 The painting is of the castle in Zuheros, Spain. Zuheros is a fabulous little white village in Andalucia. The castle is built into the rock of the mountain where from the top can be seen a gorgeous view of the country. I will be returning to teach in Andalucia, Spain this October 4-14. The course is at a beautiful resort about an hour outside of Malaga. It is an old mill that has been renovated into a resort surrounded by olive groves. We will be spending the first couple of days at the resort painting on site. Then we head out to one of the villages to sketch and photograph. 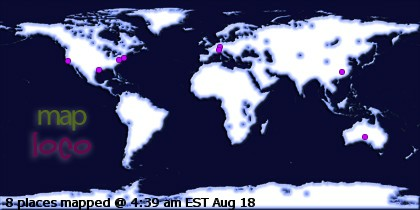 We will eventually go out to 3 different locations- Zuheros being one of them. We will also visit Ronda, with its fabulous Roman Bridge and Cordoba with the Great Mosque (La Mezquita) and a Flamenco show will be seen. It is 12 days of paradise with some of the best Mediterranean food I have ever eaten provided by chef Mike Powell. A brochure detailing this painting holiday can be found by clicking here. I have been receiving several questions about techniques in my email box. 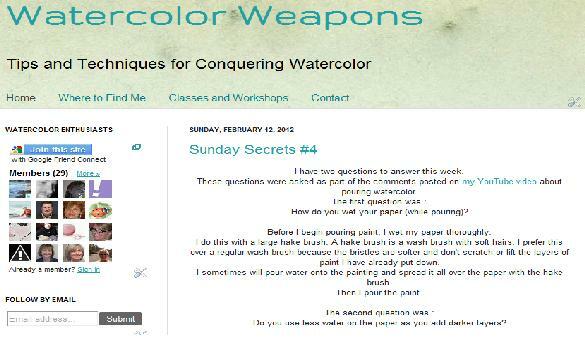 To answer these questions, I decided to create Sunday Secrets every Sunday on my new blog. This morning I went to see the new Federation of Canadian Artists Abstract Show that is on at their gallery. My painting, Crashing, had been accepted into the show and I there to see the show as well as pick up another painting. To my surprise and my delight, I discovered that Crashing won an Award of Excellence. Yeah! Happy Days! The show is on from now until February 19 at the Federation Gallery on Granville Island. I was finally able to sit down and complete my pour over the weekend. Most of what I did was lighten a couple of areas, brightened the flowers, and straightened lines. The photo below is some of the work done by the students in my class. I loved teaching them and feel like each one came away with an unique painting. This is the result of my fourth and last pour. The photo above is what it looks like before I took off the masking fluid. After it dried, I removed the masking fluid to reveal the painting. This is what it looks like after removing the mask. Now I will clean up a few areas, brighten others, and clean up some lines before I call it complete. After pour #2 dried, I then masked more on my painting. I work from a black and white photograph when I do my masking. It is easier to see the values that way. With pouring, I end up with 5-6 different values. The first mask was the whites that I wanted to save. The next mask was the next lightest value. The third mask is a mid scale value. At that point I can choose to mask again and pour my blacks or pull up the masking fluid paint the darkest darks. 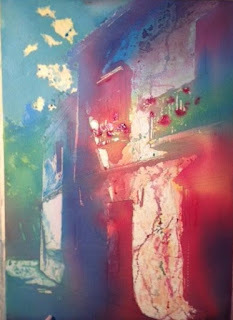 For pour #3, after I have masked my mid values as well as the red flowers (I want to save them as is). I mixed up my paint with more concentrated pigment. I wet the painting again and I used an eye dropper to drop the color in where I want it and move the board around to let the color flow. Then I let it dry. The above photo is the result of this pour after it has dried.